Diesel is the fuel of economic growth both domestically and abroad. The diesel prices you pay are influenced by many factors beyond U.S. supply and demand. The good news is buyers and sellers of fuel can control their costs and profit margins despite unpredictable fuel prices. In this blog, we will learn how diesel buyers can manage risks associated with fuel price volatility. This post draws from a recent episode of the OPIS Crash Course I recorded with OPIS. Listen to our full podcast here. What Makes Diesel Prices Change? Many thought the increase in shale gas production and a move closer to U.S. energy independence would reduce volatility. But that really hasn’t been the case. OPEC and non-OPEC producers outside of the U.S. have been working together to lower global petroleum inventories. Strong global demand for diesel has kept the price supported. Buyers are exposed to unpredictable events ranging from geopolitical issues to meteorological events. Here’s a clip from our recent podcast: Click to listen. For the transportation industry, diesel fuel is a big budget item, typically running right behind labor costs. An increase in price can put a large dent in profit margins or make the fuel user less competitive. Many diesel buyers budget for its cost but do nothing to ensure that the budget will be met. Some companies opt for surcharges related to fuel price increases. The problem is that surcharges may not cover risk completely for various reasons: companies may face pushback from customers who don’t want to pay extra, competitors may not charge surcharges in order to grow market share or the surcharge amount may not keep up with what must be paid to purchase fuel. So, How Can a Company Manage Diesel Fuel Price Risk? Hedging is a risk management strategy that’s used to decrease the probability of loss from fluctuations in the price of any commodity. Here’s a little more from our podcast: Click here. Companies can hedge their price risks using financial instruments, such as futures contracts or options traded on a public exchange. They can also use contracts traded off-exchange platforms, called over-the-counter instruments or swaps. Hedging is similar to buying insurance, although the two are legally different contracts. We buy auto insurance to protect from unforeseen accidents. We pay a premium to the insurance company, but we only see a benefit in the event of an accident. Similarly, hedging serves as protection for the fuel buyer’s budget. If prices go up, hedging allows for an offsetting source of funds that can be used to counterbalance the higher cost of fuel from the supplier. Here’s a snippet from the podcast: Click to hear it. How Can My Company Start Hedging Diesel Prices? The first step when considering a hedging program is to assess your company’s own price risk. Risks may differ depending on where the buyer is in the fuel chain. There are some companies that believe they don’t have risk because they pass along price increases to customers. But how do they differentiate themselves from the competition? One of the benefits of hedging is you can offer different customer programs like fixed price sales of fuel with less risk. In transportation, we work with fleets that can haul without surcharges. Listen to this clip from our podcast, here. Once a company chooses to manage risks by setting up a hedging program, there are several ways to get started. One is to partner with fuel specialists who are familiar with the hedging instruments and can effectively use them to manage risks associated with diesel fuel prices. When using exchange-traded instruments, you need to approach a licensed firm set up to transact in futures and options. Education is the key to success. To learn more, you should attend hedging and risk management courses. My company offers POWERHOUSE Practical Fuel Hedging, which is designed for people who want to understand how hedging works and to learn about different strategies that can help them offset their risks and build their businesses. OPIS also has courses designed to help you understand the intricacies of buying physical fuel. But, really, the best way to learn how to hedge is do it. Listen to an example from an attendee in one of my classes. In the podcast, I share additional experiences, so be sure and tune in to the full episode for more. There’s a lot to think about when setting up a hedging strategy for your company. Some people wonder if hedging itself is risky, especially if your company considers itself “conservative” in its approach. But, I’ll leave you with this thought: a company that considers itself conservative should be primarily concerned with holding onto what it has worked so hard to achieve. If you are giving away your hard-earned profits because of exposure to unpredictable price moves in the market, isn’t not choosing to hedge the riskiest gamble of all? At OPIS, we make it our goal to help people in the global energy market buy and sell with confidence. We see fuel price education as the first step to achieving that aim. 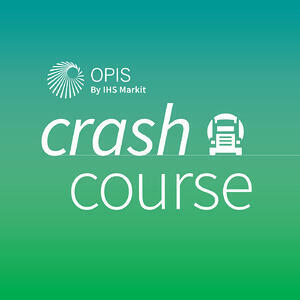 Each episode of the OPIS Crash Course will answer a key question in the fuel market related to the commodities we cover. Our goal is to bring you and anyone on your team up to speed on the dynamic fuel price marketplace, drawing on 40+ years of OPIS expertise. Visit our podcast page to subscribe for free today. We'll connect you to this episode and provide instant notifications of new ones! Disclaimer: Futures trading involves significant risk and is not suitable for everyone. Transactions in securities futures, commodity and index futures, and options on futures carry a high degree of risk. The amount of initial margin is small relative to the value of the futures contract, meaning that transactions are heavily "leveraged." A relatively small market movement will have a proportionately larger impact on the funds you have deposited or will have to deposit: this may work against you as well as for you. You may sustain a total loss of initial margin funds and any additional funds deposited with the clearing firm to maintain your position. If the market moves against your position or margin levels are increased, you may be called upon to pay substantial additional funds on short notice to maintain your position. If you fail to comply with a request for additional funds within the time prescribed, your position may be liquidated at a loss and you will be liable for any resulting deficit. Powerhouse is a registered affiliate of Coquest, Inc.
And much more – all from your desk.